Over the past two decades, America has become increasingly dependent on military contractors in order to carry out military operations abroad (in fact, the government’s extensive use of private security contractors has surged under Obama). According to the Commission on Wartime Contracting in Iraq and Afghanistan, the United States can no longer conduct large or sustained military operations or respond to major disasters without heavy support from contractors. As a result, the U.S. employs at a minimum one contractor to support every soldier deployed to Afghanistan and Iraq (that number increases dramatically when U.S. troop numbers decrease). For those signing on for contractor work, many of whom are hired by private contracting firms after serving stints in the military, it is a lucrative, albeit dangerous, career path (private contractors are 2.75 times more likely to die than troops). Incredibly, while base pay for an American soldier hovers somewhere around $19,000 per year, contractors are reportedly pulling in between $150,000 – $250,000 per year. With paid contractors often outnumbering enlisted combat troops, the American war effort dubbed by George W. Bush as the “coalition of the willing” has since evolved into the “coalition of the billing.” The Pentagon’s Central Command counts 225,000 contractors working in Iraq, Afghanistan, and elsewhere. Between December 2008 and December 2010, the total number of private security contractors in Afghanistan increased by 413% while troop levels increased 200%. Private contractors provide a number of services, including transport, construction, drone operation, and security. One military contractor, Blackbird, is composed of former CIA operatives who go on secret missions to recover missing and captured US soldiers. Then there is the Lincoln Group which became famous for engaging in covert psychological operations by planting stories in the Iraqi press that glorified the U.S. mission. Global Strategies Group guards the consulate in Basra for $401 million. SOC Inc. protects the US embassy for $974 million. Unfortunately, fraud, mismanagement and corruption have become synonymous with the U.S. government’s use of military contractors. McClatchy News “found that U.S. government funding for at least 15 large-scale programs and projects [in Afghanistan] grew from just over $1 billion to nearly $3 billion despite the government’s questions about their effectiveness or cost.” One program started off as a modest wheat program and “ballooned into one of America’s biggest counterinsurgency projects in southern Afghanistan despite misgivings about its impact.” Another multi-billion-dollar program resulted in the construction of schools, clinics and other public buildings that were so poorly built that they might not withstand a serious earthquake and will have to be rebuilt. Then there was the $300 million diesel power plant that was built despite the fact that it wouldn’t be used regularly “because its fuel cost more than the Afghan government could afford to run it regularly.” RWA, a group of three Afghan contractors, was selected to build a 17.5 mile paved road in Ghazni province. They were paid $4 million between 2008 and 2010 before the contract was terminated with only 2/3 of a mile of road paved. The practices employed by the military contractors also reflect poorly on America’s commitment to human rights—both in the way that they treat their employees and in their employees’ behavior. For example, Triple Canopy houses its employees in overcrowded shipping containers. In addition to soliciting underage Chinese prostitutes, AGNA contractors have also been described as “peeing on people, eating potato chips out of [buttock] cracks, vodka shots out of [buttock] cracks (there is video of that one), broken doors after drnken [sic] brawls, threats and intimidation from those leaders participating in this activity…” This behavior is not reserved to lower level employees, and has been observed and even encouraged by upper level management. Blackwater employees have also been accused of weapons smuggling as well as cocaine and steroid use. Despite all this, Blackwater—which, as the New York Times has reported, “created a web of more than 30 shell companies or subsidiaries in part to obtain millions of dollars in American government contracts after the security company came under intense criticism for reckless conduct in Iraq”—still won a cut of a $10 billion contract given out by the State Department in 2010. Despite the high levels of corruption, waste, mismanagement and fraud by military contractors in Iraq and Afghanistan, the U.S. government continues to shield them, resisting any attempts at greater oversight or accountability. 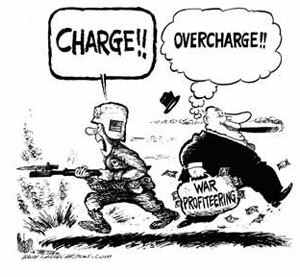 War, after all, has become a huge money-making venture, and America, with its vast military empire, is one of its best customers. Indeed, the American military-industrial complex has erected an empire unsurpassed in history in its breadth and scope and dedicated to conducting perpetual warfare throughout the earth. What most Americans fail to recognize is that these ongoing wars have little to do with keeping the country safe and everything to do with enriching the military industrial complex at taxpayer expense. It’s the military industrial complex (the illicit merger of the armaments industry and the government) that President Dwight D. Eisenhower warned us against more than 50 years ago and which has come to represent perhaps the greatest threat to the nation’s fragile infrastructure today.